For centuries, Western scholars have tried to tease apart the many unknown aspects of Polynesian history. The islands are spread across an area of the Pacific Ocean (and beyond) so large that all of the Eart Christina Thompson is the author of Come On Shore and We Will Kill and Eat You All, which I read and loved. I was thrilled when I saw that she was about to publish another book, and even more so when I found a review copy; thanks go to Edelweiss and Harper Collins. This book is for sale now. It's been a traveling year for me in books. I intentionally went first to Trieste and stayed there, for a while, longer than I planned. Oddly, it was logical to go from there directly to Wales. And I book a flight for Nowa Ruda whenever Olga calls. Still in a traveling mood, I boarded a ship, but a creaky one, with only hardtack, mealy biscuits and stale water for dinner. We followed the currents and trade winds, going east first before we turned west. The worst was when we were becalmed. Eventua It's been a traveling year for me in books. I intentionally went first to Trieste and stayed there, for a while, longer than I planned. Oddly, it was logical to go from there directly to Wales. And I book a flight for Nowa Ruda whenever Olga calls. Still in a traveling mood, I boarded a ship, but a creaky one, with only hardtack, mealy biscuits and stale water for dinner. We followed the currents and trade winds, going east first before we turned west. The worst was when we were becalmed. Eventually we spotted certain birds that my more experienced mates knew meant land. The water changed, clearer, and seaweed with it. A large, large cloud. When we finally disembarked, we stood on a floating island - the ground beneath your feet is not really land the way that most people understand it. Yet most surprising, on this speck, we found people. And so, I came to the Polynesian Triangle, like the Europeans before me: with luck, with wonder, and with my own notions. This book raises the obvious questions. Where did these people come from? How did they get there? And why? Some of these questions are even answered. And along the way some things we were taught as children get debunked. Like maybe Thor Heyerdahl was more brave than, you know, correct. -- and that in seafaring, the most sensitive balance was a man's testicles. Some of the things I learned I already had a pretty good hunch about. Very interesting book on how Polynesia was populated and how the Western viewpoint dismissed them and their knowledge for years. Sea People is a wonderful little book about how and when the Polynesians ended up in Polynesia. Beginning with the moments when Europeans first discovered unknown inhabited islands in the middle of the Pacific Ocean going forward through all of the documentation and then science used to answer these questions. I cannot even imagine getting into a outrigger canoe and traveling to some unknown island that may or may not be there. It was fascinating. This was such a wonderful book! I listened to the audiobook, narrated by Susan Lyons, who did a great job. I do wish that the narrator had been a Polynesian person, but that's my only complaint, really. The writing is evocative and lush--at times the book reads almost like a novel. It incorporates Polynesian legends and myths with accounts from European explorers. I especially loved the last part, which details the resurgence and reclamation of traditional sailing and navigating by the Polynesia This was such a wonderful book! I listened to the audiobook, narrated by Susan Lyons, who did a great job. I do wish that the narrator had been a Polynesian person, but that's my only complaint, really. The writing is evocative and lush--at times the book reads almost like a novel. It incorporates Polynesian legends and myths with accounts from European explorers. I especially loved the last part, which details the resurgence and reclamation of traditional sailing and navigating by the Polynesian people. Summary: A mostly entertaining look at how our theories about unrecorded history evolve, with a few slow bits. "For more than a millennium, Polynesians have occupied the remotest islands in the Pacific Ocean, a vast triangle stretching from Hawaii to New Zealand to Easter Island. Until the arrival of European explorers they were the only people to have ever lived there. Both the most closely related and the most widely dispersed people in the world before the era of mass migration, Polynesians ca Summary: A mostly entertaining look at how our theories about unrecorded history evolve, with a few slow bits. "For more than a millennium, Polynesians have occupied the remotest islands in the Pacific Ocean, a vast triangle stretching from Hawaii to New Zealand to Easter Island. Until the arrival of European explorers they were the only people to have ever lived there. Both the most closely related and the most widely dispersed people in the world before the era of mass migration, Polynesians can trace their roots to a group of epic voyagers who ventured out into the unknown in one of the greatest adventures in human history. How did the earliest Polynesians find and colonize these far-flung islands? How did a people without writing or metal tools conquer the largest ocean in the world? This conundrum, which came to be known as the Problem of Polynesian Origins," (source) and how people have tried to answer it, is the focus of this book. I started this book shortly after reading Simon Winchester's Krakatoa, which had a downright colonial perspective. I was worried this would be the same, but was hoping for a focus on Polynesian perspectives. I think it delivered to the extent possible on this topic. It seems that most surviving records from the earliest time periods the author covers are from Europeans. Unlike Winchester though, the author doesn't treat this as the only perspective that matters. She shares European accounts of Polynesian origin stories. She also discusses the limitations of the European records, due to their perspective or lack of knowledge. Where possible, she gives some informed speculation about the ways the perspectives of the Polynesians might differ. Christina Thompson - Christina Thompson writes about the history of the Pacific. Her first book, Come on Shore and We Will Kill and Eat You All, was at once a history of 18th- and 19th-century New Zealand and a memoir of her her marriage to a Maori man. 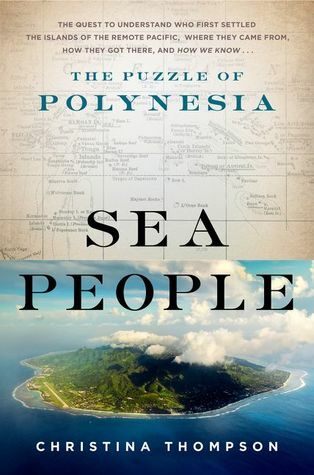 Her second book, Sea People, is a history of the settlement of remote Oceania by the ancestors of the Polynesian people. A dual citizen of the US and Australia, she is the editor of Harvard Review and teaches writing and editing at Harvard University Extension.